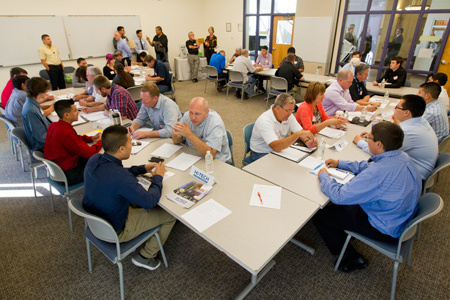 SAMP is a committed group of Tucson manufacturing companies working in close partnership with Arizona@Work Pima County, Pima Community College (PCC), Desert View High School and Tucson Magnet High School to develop the manufacturing workforce of the future. Both Desert View High School and Tucson Magnet High School work in collaboration with Pima County Joint Technical District (JTED) on their student precision machining/manufacturing program. SAMP member companies participate by employing students through the Internship Program. Interns are enrolled at PCC. The 18 month internship program with the member company reinforces concepts they learn in the classroom and gives interns experience working with modern manufacturing equipment. By employing interns, SAMP companies are able to engage with educators to close any skill gaps of the students. With the help of SAMP companies, educators have been able to make changes to curriculum that will better prepare students for a career in manufacturing. Curriculum development and redesign has been based on accepted industry standards from the National Institute of Metalworking, Inc. (NIMS).